KORN - LIVE AT THE HOLLYWOOD PALLADIUM (BLURAY+CD SET) | Online Shop | Wizard LTD. 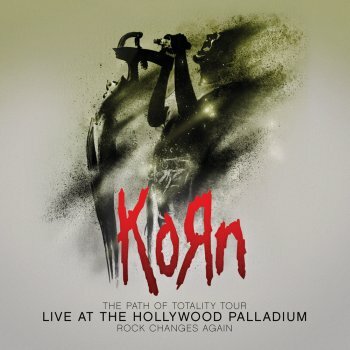 Album: "LIVE AT THE HOLLYWOOD PALLADIUM (BLURAY+CD SET)"
KORN - Live At The Hollywood Palladium! KORN performs an exclusive live concert featuring songs from their new album "The Path To Totality" with special guest performances by some of the leading dubstep and electronic music producers in the world, including Skrillex, Excision, Datsik, Downlink, Kill the Noise, and 12th Planet along with Korn classic hits. The result is this once in a lifetime Concert Film, which is something completely new, yet utterly and definitively KORN ! Produced by Rock Fuel&apos;s Barry Summers, KORN Live At The Hollywood Palladium captures KORN&apos;s live show on film like never before. The combination of art and science, technology, emotion, and explosive theatrics elevates this live concert to technological rock mastery! Interviews with Jonathan Davis, James (Munky) Shaffer, Fieldy Arvizu, Ray Luzier, Zachary Baird and ROBOTO (album and DVD illustration).